This is the first proper London show in AGES for Lobelia and I, so we’re making it a special one. We’ve asked 3 of our favourite singers to join us for an amazing night of singer-songwriter-ness… and genius Ukulele magic. It’ll be on Aug 25th, doors at 7pm, music from 7.30, at Darbucka World Music Bar, on St John’s Street in Clerkenwell, London. Miriam Jones – I played on Miriam’s latest EP, she’s married to my hugely talented friend Jez Carr, and between them, they clearly have one of the most musically gifted marriages since Joni Mitchell married Larry Klein. She writes beautiful, moving, often funny songs, sings like an angel, and has a gorgeous stage presence. 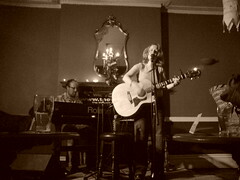 Have a listen to her on Spotify, Myspace or ReverbNation. 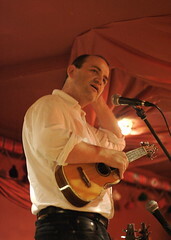 Lloyd Davis – Lloyd has become our musical mascot – ukulele playing, 1930s song-singing, delightful chap. The kind of music you rarely hear, but that makes you grin from ear to ear whenever you do. Every time we play in london now, I get emails saying ‘is the dude with the ukulele going to be there?’ – he’s special, he’s on first, and you NEED to get there for 7.30 to see him work his magique. Watch Lloyd on Youtube. It’s going to be fabulous, believe me. Tickets will be £7, or £5 for concessions – no advanced sales, all on the door. Bring your friends, and plan to eat – the food at Darbucka is amazing (feel free to post Darbucka food reviews in the comments on this!) It’ll all be finished by 10.30, so no need for night buses. It’s our favourite venue to play – a great listening environment – with some of our favourite musicians. Come and be part of our favourite audience. 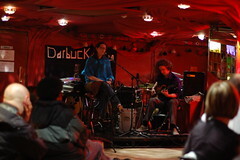 Hopefully this’ll be part of a new series of shows at Darbucka, not having played there for quite a while. I really miss it.